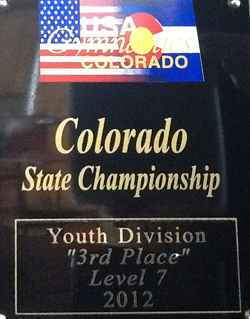 Premier Gymnastics of the Rockies Places eighth Overall out of 26 teams at the 2012, Colorado USAG Level 7 State Championships, held on March 31 and April 1. 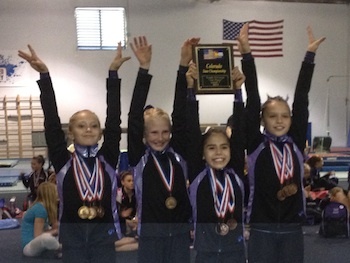 The Loveland based team performed well, with several gymnasts placing in the All-Around Competition across all Divisions. The Youth Age Division Team placed third overall in their session for Team Awards. The team consists of Tatum Graham, Aryn Archambeau, Kairey Vela and Sidney Strizki. Competitors who medaled in the Individual All-Around Competition were: Tatum Graham, 9th place and Kairey Vela, 11th place in the Youth A Division. Aryn Archambeau placed 8th in the Youth B Division. Morgan Adams placed 9th in the Junior A Division. Josie Spitz placed 4th in the Senior A Division and Alyssa Strong Placed 10thin the Senior B Division. Individual event medalists were: Abbie McCrimmon who medaled on Floor in the Child A Division. Jaxi Melby medaled on Vault, Bars and Floor in Child B Division. Graham medaled on Vault, Bars and Floor. Vela medaled on Bars and Beam and Sidney Strizki is the Bronze medalist on Bars in the Youth A Division. Archambeau is the Bronze medalist on Floor and also medaled on Vault, Bars and Beam in the Youth B Division. Adams is the Bronze medalist on Bars and Placed 4th on Vault in the Junior A Division. Spitz is the Gold medal Vault Champion with a Score of 9.650 and Placed 5th on Floor and medaled on Bars in the Senior A Division. Strong medaled in Bars, Beam and Floor and Kelsey Knuth is the Bronze medalist on Vault and medaled on Beam in the Senior B Division. Congratulations PGR! Great Job! Great Season! Site contents copyright © 2019 Recorder Online	except as noted. All rights reserved. | 89 queries in 2.525 seconds.